Pictures of the painted fresco Etruscan underground tombs of the Necropolis of Tarquinia, known as Monterozzi Necropolis or the Monte del Calvario Necropolis. There are around 6,000 tombs cut into the rock at Tarquinia and those that have been excavated have revealed incredible Etruscan fresco wall paintings dating back to the 7th century BC. The underground tombs of Tarquinia are so unique that they were designated as UNESCO World Heritage sites in 2004. The Etruscan paintings are some of the oldest known paintings in present day Italy, and their sophisticated depictions have given historians an insight into Etruscan Culture and burial rights. The Etruscans pre dated the Romans and created the earliest urban civilisation in the northern Mediterranean. They were slowly conquered incorporated into the Roman Empire which eclipsed them completely even though mush of what we think as Roman and many of the great cities we associate with the Romans were in fact Etruscan. The area around Tarquinia is made up of volcanic ash Tuff rock that can be easily cut into and carved. At Tarquinia the Etruscans built their tombs 15 meters or so underground and the tombs were accessed vis a flight of stairs. Most of the tombs are single chamber with a burial pit or benches on either side of the room for cinerary urns.The painted Etruscan tombs at Tarquinia were replicas of Etruscan houses with painted fresco pillars and architectural details. Some are painted as replica tents with views to trees outside and wild ducks caught during a hunt hanging inside. The painted tombs of Tarquinia seem to have been burial chambers for families and extended families. Although some have what seem to be pits in the floors and troughs cut into the walls for burial of bodies, the more common way of burial for the Etruscans was cremation. 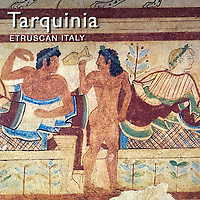 The paintings at Tarquinia depict aspects of living that we associate with the Romans which indicated the influence the Etruscans were on them. Banqueting is a popular fresco theme in the teams. This not only depicts how the Etruscans liked to relax but also may represent some of the rights performed during burial. Dancers and musicians are also popular scenes of the Tarquinia tombs. Again it is not known if these are meant to represent an afterlife full of joy or if they represent what took place during Etruscan burial rights. Many aspects of Etruscan life are depicted with hunters, fishermen, athletes and jugglers. People in the paintings on the tombs of Tarquinia are dressed in togas that was also adopted by the Romans and used as their ceremonial dress. Apart from the painted Greek tombs of Paestum, the Etruscan paintings of Tarquinia are the only frescoes of that survive from that era making them a vital link in the history of art. Download pictures of the Etruscan fresco tomb paintings of the Monterozzi Necropolis of Tarquinia as stock photos or as photo wall art.